Advisor: Kathleen A. Duval, Associate Professor of History, The University of North Carolina at Chapel Hill, National Humanities Center Fellow. Why did some European attempts to establish colonies in the New World succeed while most failed? Early European colonies in the New World succeeded only if local Indians allowed them to and if they were lucky. When European settlers arrived in the New World, they often placed their colonies among people who had established complex webs of political relationships that included both alliances and rivalries. If Indians tolerated settlements they could easily have wiped out, they may have done so not because they were afraid of the settlers or kindly disposed to them or militarily weak but rather because they saw them as useful adjuncts in their own internal power struggles. Informational text with moderately complex purpose, text structure, and knowledge demands, and very complex language features. Tier 2 vocabulary words are defined in pop-ups (full list at bottom of page). Tier 3 words are explained in brackets. We do not know why the Indians of the Chesapeake, fierce protectors of their own territory, refrained from destroying the weak vulnerable English outpost in its earliest days, especially since these same tribes wiped out the Spanish mission of Ajacán thirty-seven years earlier. (For a companion lesson see Failed European Colonies in the New World.) The Indians left no written record of their experience with the settlers. However, we do have Percy’s account. If we keep in mind the limitations of his understanding of Indian culture, his European biases, language barriers, the dangerous situation the settlers were in, and the rivalries that apparently existed among the various tribes, we can, through careful and sensitive reading, arrive at a plausible speculation: perhaps the Indians allowed Jamestown to survive because the presence of the English provided advantages to some tribes — trade goods, for example, or prestige — as they vied with others to gain power within the Powhatan Confederation. This exercise in close reading will allow students to be ethnohistorians, discerning the motives and actions of people who left no written evidence. Students may need some pushing to get them to consider the Indian’s point of view. The first passage illustrates some of the ambitions of the Jamestown colony. The English saw Spain both as an evil Catholic empire, reaping riches through barbarous treatment of Indians, and as a model of how to collect the riches that the English wished for themselves. The settlers of Jamestown knew that they had chosen a spot not far from Spanish St. Augustine and within the larger territory that Spain still claimed, although the peace that their new king, James I, had negotiated with Spain in 1604 meant they should be protected from Spanish attack. The second passage brings together all the references Percy makes to the Indians. Among other things, it introduces students to the discussions and debates that the Indians were having regarding what to do about the English. Of course, most of these discussions took place when Percy was not present to record them, but the disagreement suggested here between some of “the Savages” and their werowance can help students imagine how those discussions might have gone. Some Indians were disturbed that the English were “planting,” in other words that they seemed to be intending to settle rather than merely trade. One of the discussion questions asks students to think about the nature of the Powhatan Confederation, in which Powhatan required subordinate werowances to pay tribute to him. Might this political situation have led some to welcome the Virginians? As you analyze this passage, pay attention to the rivalry between the Rapahanna and the Paspihe. This lesson is divided into two parts, both accessible below. The teacher’s guide includes a background note, the text analysis with responses to the close reading questions, access to the interactive exercises, and a follow-up assignment. The student’s version, an interactive worksheet that can be e-mailed, contains all of the above except the responses to the close reading questions, and the follow-up assignment. For what audience is it intended? For what purpose is it written? These excerpts from Percy’s Observations chronicles the first six months of Jamestown’s existence, from April to September, 1607, a period during which the colony survived only because the Indians allowed it to. 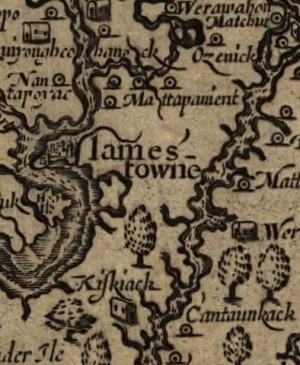 Luck played its role in 1610, when all the remaining colonists, fleeing the utter failure of Jamestown in four small boats, encountered, at the mouth of the James River, a re-supply fleet headed their way. On board were three hundred new settlers and a new governor, Lord De la Warr, who ordered the fleeing boats to turn around. With fresh manpower Jamestown began the slow painful process of establishing itself as a profitable agricultural colony. At the time of Jamestown’s founding George Percy was just one of several noblemen among the colonists. He later served as governor of the colony. The original manuscript of his Observations has been lost. It was published in 1625 as part of a larger collection of accounts of travel in the Americas. When analyzing any primary document, it is important to consider the author’s motives in writing it. Apparently, Percy wrote Observations simply to record his experience in Virginia. It seems to have been intended for readers interested simply in learning more about the fascinating “new world.” What matters here is what Percy was not doing: he was not trying to recruit settlers, nor was he trying to raise money to support Jamestown. How might these considerations shape our interpretation of his Observations? The Indians Percy and his fellow settlers encountered were well-organized politically under the leadership of Chief Powhatan. He commanded about thirty tribes, yet each local tribe had its own chief or werowance, who was subordinate to Powhatan and who had to pay him tribute. Percy and the settlers traveled from town to town meeting these chiefs. Like most seventeenth-century peoples, the Indians believed they were the center of the world. To them, the English newcomers were needy itinerants, not colonizers, and they expected to call the shots. 1. What do Percy’s words here tell us about English reasons for founding Jamestown? The colonies has resources that would be useful to England, “the Country being so fruitful”. It would have also be “a great annoyance to our enemies,” an annoyance to Spain, if England had been there during the war with Spain. So it is a useful military staging ground. 2. What do you think he thought of the Spanish? He saw the Spanish as rivals and enemies. 3. Judging from Percy’s statement, what role do the Indians who inhabit the region play in the plans of the English? The Indians have little role in the plans of the English. Percy does not mention them in the first excerpt. [I]f the beginners of this action [the Virginia Company] do carefully further [support] us, the Country being so fruitful, it would be as great a profit to the Realm of England, as the Indies to the King of Spain. If this River which we have found had been discovered in the time of war with Spain, it would have been a commodity [profit] to our Realm, and a great annoyance to our enemies. 4. What does this passage tell us about how well the English understand the Indians? The English little understood the Indian culture. They assumed the Indians were burning off a field for planting or signaling, which is what the English would do. They also did not understand how the Indians fought, at night. 5. Why would the English expect the Indians to attack them? The Indians had attacked before. Compare the conflicting views of Native Americans and Europeans regarding the early English colonies in the New World. At night, when we were going aboard, there came the Savages creeping upon all fours, from the Hills, like Bears, with their Bows in their mouths, [who] charged us very desperately in the faces, hurt Captain Gabriel Archer in both his hands, and a sailor in two places of the body very dangerous. After they had spent their Arrows, and felt the sharpness of our shot, they retired into the Woods with a great noise, and so left us. We marched some three or four miles further into the woods, where we saw great smokes of fire. We marched to those smokes and found that the Savages had been there burning down the grass, as we thought either to make their plantation there [to clear the land for farming], or else to give signs to bring their forces. Thirtieth day, we came with our ships to Cape Comfort; where we saw five Savages running on the shore. Presently the Captain caused the shallop [small open boat] to be manned; so rowing to the shore, the Captain called to them in sign of friendship, but they were at first very timorous, until they saw the Captain lay his hand on his heart; upon that they laid down their Bows and Arrows, and came very boldly to us, making signs to come ashore to their Town, which is called by the Savages Kecoughtan [“great town,” commanded by a son of Powhatan]. We coasted to their Town, rowing over a River running into the Main[land], where these Savages swam over with their Bows and Arrows in their mouths. 6. How might you account for the hospitality shown the English by Powhatan’s son only days after Indians attacked the settlers? He might wish to find out more about the whites — their intentions, strength, etc. He might also wish to open trade negotiations, or use his relationship with the whites as a sign of his strength within the Powhatan culture. 7. How might the tribes in the Powhatan Confederation interpret the fact that one of Powhatan’s sons entertained the English? The might think that Powhatan’s son was attempting to develop a diplomatic relationship with the English. 8. What does this passage tell us about European perceptions of Indians and their understanding of Indian culture? When we came over to the other side, there was a many of other Savages which directed us to their Town, where we were entertained by them very kindly. When we came first a Land they made a doleful noise, laying their faces to the ground, scratching the earth with their nails. We did think they had been at their Idolatry [worship]. When they had ended their Ceremonies, they went into their houses and brought out mats and laid upon the ground: the chiefest of them sat all in a rank; the meanest [lowest, poorest] sort brought us such dainties as they had, and of their bread which they make of their Maize or Gennea [Guinea] wheat. They would not suffer [allow] us to eat unless we sat down, which we did on a Mat right against them. After we were well satisfied they gave us of their Tobacco, which they took in a pipe made artificially of earth as ours are, but far bigger, with the bowl fashioned together with a piece of fine copper. After they had feasted us, they showed us, in welcome, their manner of dancing, which was in this fashion. One of the Savages standing in the midst singing, beating one hand against another, all the rest dancing about him, shouting, howling, and stamping against the ground, with many Antic tricks and faces, making noise like so many Wolves or Devils. 9. What does the scene in the Paspihe village — an entertainment with “much welcome” interrupted by an “old Savage’s” rant — suggest about the Paspihe’s response to the arrival of the English? Compare the Paspihe’s welcome with that which the English received in the village of Kecoughtan (see paragraphs 3 and 4) and in the Raphanna village. While the general tribe was welcoming, some of the older members were suspicious of the English. 10. What does the response of the Rapahanna’s chief to the presence of the English among the Paspihe suggest about relations between the two tribes? It suggests that the two tribes were rivals. 11. Why might the Raphanna chief have been displeased that the English visited the Paspihe village before visiting his? He might have thought it would give the Paspihe village an advantage over his own village. 12. Why might it have been advantageous to Powhatan to permit rivalries among the tribes in his confederation? If there were rivalries among the tribes, no leader within a tribe could become strong enough to challenge Powhatan. The fourth day of May, we came to the King or Werowance of Paspihe [Paspahegh]: where they entertained us with much welcome. An old Savage made a long Oration, making a foul noise, uttering his speech with a vehement action, but we knew little what they meant. While we were in company with the Paspihes, the Werowance [leader] of Rapahanna came from the other side of the River in his Canoe. He seemed to take displeasure of our being with the Paspihes. He would fain [gladly] have had us to come to his Town. The Captain was unwilling. Seeing that the day was so far spent, he returned back to his ships for that night. The next day, being the fifth of May, the Werowance of Rapahanna sent a Messenger to have us come to him. We entertained the said Messenger, and gave him trifles [trinkets] which pleased him. We manned our shallop with Muskets and Targatiers [foot soldiers armed with shields] sufficiently: this said Messenger guided us where our determination was to go. When we landed, the Werowance of Rapahanna came down to the water side with all his train [followers]… playing on a Flute made of a Reed…. He entertained us in so modest a proud fashion, as though he had been a Prince of civil government, holding his countenance [keeping his bearing] without laughter or any such ill behavior. 13. Why, after some Indians entertained the English cordially, would the Apamatica confront them “in a most warlike manner”? They may have seen the English as enemies, aligned with a rival tribe. 14. What do the Apamatica demand of the English? 15. What might the English have signaled through their “signs of peace” that convinced the Apamatica to let them land? They may have displayed trinkets or other things to trade. An earlier tribe (see paragraph 3) had responded to the Captain “lay his hand on his heart,” and he may have done this. The eighth day of May we discovered [explored] up the River. We landed in the Country of Apamatica. At our landing, there came many stout and able Savages to resist us with their Bows and Arrows, in a most warlike manner, with the swords at their backs beset with sharp stones, and pieces of iron able to cleave a man in sunder [cut a man in two]. Among the rest one of the chiefest, standing before them cross-legged, with his Arrow ready in his Bow in one hand, and taking a Pipe of Tobacco in the other, with a bold uttering of his speech, demanded of us our being there, willing us to be gone. We made signs of peace, which they perceived in the end, and let us land in quietness. 16. How might the establishment of Jamestown in the Pasphie’s country affect that tribe’s attitude toward the English? They may have been suspicious of the English’s intent to permanently settle. 17. What does the “alarm” suggest about the Indian’s approach to the English settlement? The English felt threatened by the Indian’s approach. The thirteenth day, we came to our seating place [Jamestown] in Paspihas Country, some eight miles from the point of Land, which I made mention before: where our ships do lie so near the shore that they are moored to the Trees in six fathom water. The first night of our landing, about midnight, there came some Savages sailing close to our quarter. Presently there was an alarm given; upon that the Savages ran away, and we [were] not troubled any more by them that night. Not long after there came two Savages that seemed to be Commanders, bravely dressed, with Crowns of colored hair upon their heads, he came as Messengers from the Werowance of Paspihae, telling us that their Werowance was coming and would be merry with us with a fat Deer. 18. How do these encounters with the Paspihae differ from the earlier “entertainment” the Paspihae provided the settlers? (See paragraph 5.) What might account for the difference? These encounters are much more adversarial. The Paspihae may have realized that the English intended to stay. 19. How do these encounters with the Paspihae differ from the settlers’ encounters with the Rapahanna? (See paragraph 6.) What might account for the difference? These encounters with the Paspihae reflect the war-like defensive poster of the Paspihae. The encourter with the Rapahanna reflected more a diplomatic trade meeting. 20. Why might the English suspect villainy on the part of the Paspihae? Since they had been attacked earlier they were suspicious. They feared that the Paspihae would remain in their fort overnight and attack them from within. 21. Why might the Paspihae werowance offer the English as much land as they wanted? Can we be sure that he actually made that offer? He used the offer of land as a stall tactic. He probably did not make the offer in the sense that the English understood the offer. 22. Why would an Indian be interested in stealing a hatchet? What might the hatchet represent? A hatchet represents a warrior. By stealing the hatchet the Indian would remind the English that the Paspihae were the superior warriors. The eighteenth day, the Werowance of Paspihae came himself to our quarter, with one hundred Savages armed, who guarded him in a very warlike manner with Bows and Arrows, thinking at that time to execute their villainy [make their deceitful attack]. Paspihae made great signs to us to lay our Arms away. But we would not trust him so far. He seeing he could not have convenient time to work his will, at length made signs that he would give us as much land as we would desire to take. As the Savages were in a throng in the Fort, one of them stole a Hatchet from one of our company, which spied [noticed] him doing the deed: whereupon he took it from him by force, and also struck him over the arm. Presently another Savage seeing that, came fiercely at our man with a wooden sword, thinking to beat out his brains. The Werowance of Paspiha saw us take to our Arms, went suddenly away with all his company in great anger. The twentieth day of Werowance of Paspiha sent forty of his men with a Deer, to our quarter: but they came more in villainy than any love they bare us. They faine would have lain in our Fort all night, but we would not suffer them for fear of their treachery. 23. How do you think the Indians might have interpreted the English cross planting ceremony? They would have been suspicious or curious. 24. What implications does the ceremony hold for the Indians? It represents the English’s attempt to Christianize them and change the Indian culture. 25. Why might it have mattered to the Indians that the captain went onshore alone? It did not represent an attack — it was only one man — so it was probably more a diplomatic effort. 26. How valuable would the gift of the hatchet be to the chief? What might it suggest to him about the English and the potential of an alliance with them? He received it “joyfully.” It was valuable for what it represented, a possible mutual military or trading alliance. 27. What reasons might local tribes in the Powhatan Confederation have had for befriending the English? Might they be seeking allies? Why would they need allies? They would be seeking allies against rival tribes. Allies would be useful for military or trading purposes. 28. Why would local Indians be concerned that the English were planting? It implies a permanence as well as exclusive use of the land. It would reduce the territory under the Paspihae’ direct control. 29. What does the werowance’s reply tell you about debates that were going on among the Indians who met the English? Debates include what force the English may use, their military strength, and their purpose — why they are there. 30. How does the werowance’s characterization of the site of Jamestown as “waste ground” reflect upon the Paspihae’s offer to give them as much as they want? As long as the English do not ask for anything valuable or pose a risk, the Paspihae can be accommodating. The four and twentieth day we set up a Cross at the head of this River, naming it Kings River, where we proclaimed James King of England to have the most right to it. When we had finished and set up our Cross, we shipped our men and made for James Fort. By the way, we came to Pohatan’s Towre [sic], where the Captain went on shore suffering none to go with him. He presented the Commander of this place, with a Hatchet which he took joyfully, and was well pleased. But yet the Savages murmured at our planting in the Country, whereupon this Werowance made answer again very wisely of a Savage, Why should you be offended with them as long as they hurt you not, nor take any thing away by force. They take but a little waste ground, which does you nor any of us any good. 31. Compare the Englishmen’s relationship with the Rappahanna to their relationship with the Pasphie. Rappahanna focused upon establishing a friendship with the English. The relationship with the Paspihae was more complicated and involved military elements. Since the English settled in Paspihae territory their relationship was more direct. The seven and twentieth of July, the King of Rappahanna demanded a Canoe, which was restored [given], lifted up his hand to the Sun (which they worship as their God), besides he laid his hand on his heart, that he would be our special friend. It is a general rule of these people, when they swear by their God which is the Sun, no Christian will keep their Oath better upon this promise. 32. Percy believed that the Indians spared Jamestown because God put a terror into their hearts. What other reasons might they have had? The English settlement could represent a balance against other tribes. They could be a trading partner or a military buffer. 33. Would you have predicted in 1607 that Jamestown would be a success? Answers will vary. Probably not, as the settlers were starving and knew little of the environment in which they found themselves. The Natives were a major determining factor in their survival. 34. At several points, the colony almost failed, whether because of starvation or sporadic war with the Indians. But ships with food and settlers arrived each time the colony was nearly empty, and over time diseases that were previously unknown in the Americas dramatically decreased the Indian population. Jamestown was eventually abandoned, but the colony of Virginia thrived with the adoption of tobacco agriculture and slavery. Why, on the whole, did Virginia survive? The English settlers were able to manipulate the environment and adjust to it for their own benefit. 35. Would you call Jamestown a successful colony? Why or why not? It pleased God, after a while, to send those people which were our mortal enemies to relieve us with victuals, as Bread, Corn, Fish, and Flesh [meat] in great plenty, which was the setting up of our feeble men, otherwise we had all perished. Also we were frequented by divers [visited by many] Kings in the Country, bringing us store of provision to our great comfort. “Early European colonies in the New World succeeded only if local Indians allowed them to and if they were lucky,” asserts Professor Duval in the understanding for this lesson. To examine her premise, read the personal accounts below relating the early months of the first three successful British colonies: Jamestown, Plymouth, and Massachusetts Bay. Using the graphic organizer, cite evidence from the accounts that reveal how luck, and the Indians’ attitude toward the colonists, influenced the colonies’ survival. Text: George Percy, Observations Gathered out of a Discourse of the Plantation of the Southern Colony in Virginia by the English, 1608 (excerpts). Text: William Bradfod, History of Plymouth Plantation, 1656 (excerpts). Text: Memoir of Roger Clap, ca. 1680s (excerpts). For more primary resources on early New World colonies, see the primary source collection American Beginnings: The European Presence in North America, 1492-1690, from the National Humanities Center. 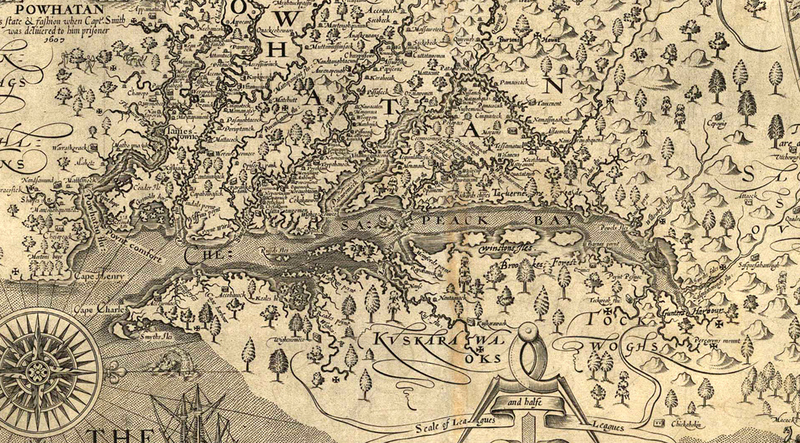 Image: John Smith, Virginia / discovered and discribed by Captayn John Smith, 1606, map, London, 1624 (detail). Library of Congress, Geography & Map Division, Call No. G3880 1624. S541 Vault. Courtesy of the Library of Congress. The lesson's efforts to provide an understanding of a coloniser's priorities are successful. To supplement the exploration of the 'diary of colonisation', I would recommend to the users of the lesson a book by Philip Weeks, "They Made Us Many Promises: The American Indian Experience".